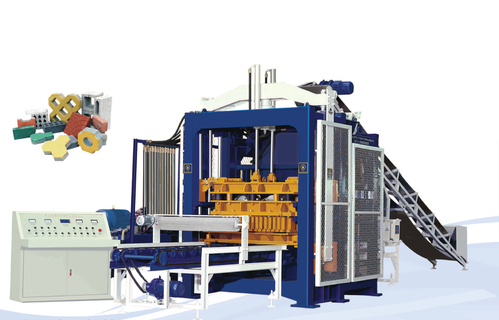 Avail from us superior quality Fully Automatic Fly Ash Bricks Making Machine Model no. JJ 9660FHP that minimizes the requirement of wood & steel pallets by laying blocks on the concrete floors. The machine we supply use less cement and can produce any type of blocks. Further, these machines are fabricated from a superior quality material that makes them highly durable, resistance and more. Additionally, these machines require and plain wooden pallet for each freshly molded block and require very little space and can be easily moved. Jayem Manufacturing Company is an ISO-9001:2008 Company and a trusted name in manufacturing, exporting, and supplying of Construction Equipment, Tower Crane, Concrete Cutter, Grab Buckets, Hydraulic Bar Cutter, and machinery for building materials for more than two decades. All the machines manufactured by 'Jayem' are working most efficiently and economically throughout India as well as abroad. The company products have been exported to Srilanka, Ethiopia and other African / and Arab countries by many reputed Export companies like Tata Exports Ltd. etc. Jayem construction equipment and building products machinery like concrete cutting machines, asphalt cutting machines and much more are very reliable, passes international standard quality and are manufactured under the supervision of technically qualified and experienced team of engineers and as per international standards. 'Jayem' had supplied and successfully commissioned many numbers of brick manufacturing plants to national Thermal Power Corporation Ltd., FARAKKA, National Thermal Power Corporation, SONEBHADRA, at almost all the thermal power plants in Andhra Pradesh under A.P.Genco Ltd. Besides, a number of plants to private customers. 'Jayem' brick manufacturing plants have been running successfully for the past several years at various places throughout India.